Azize Meryem Katedrali; Fethiye Camii. 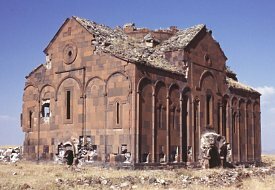 "In the year 450 (AD 1001) of the Armenians ... at the time of Sarkis, honoured by God and Katholikos, spiritual lord of the Armenians, and during the glorious reign of Gagik, shahanshah of the Armenians and of the Georgians, I Katranideh, Queen of the Armenians, daughter of Vasak, King of Siunik, entrusted myself to the mercy of God and, by order of my husband Gagik shahanshah, built this holy cathedral, which the great Smbat had founded..."
Near the southern edge of the city stands the imposing Cathedral. 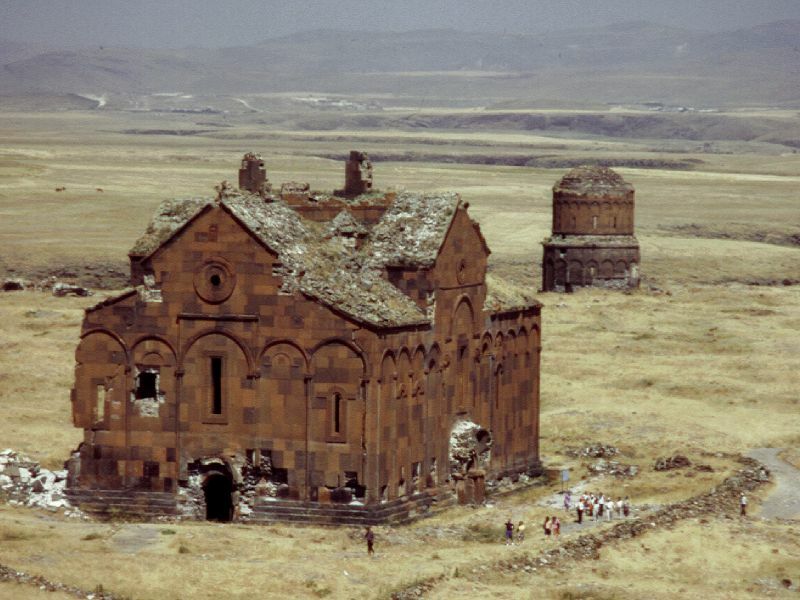 This is the largest and most important building in Ani, and a structure of world architectural importance. 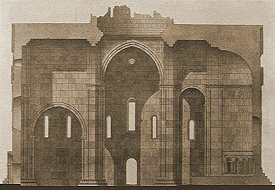 According to various historical sources and inscriptions, it is known that building work started in the year 989 under King Smbat II (977-89) and was completed, after a halt in construction, by the year 1001 (or 1010 depending on the reading of the inscription) by order of Queen Katranideh (Catherine), the wife of King Gagik Bagratuni, Smbat's successor. 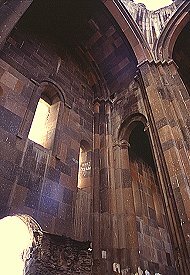 The cathedral was the work of Trdat, one of the most celebrated architects of medieval Armenia. During the siege of 1064 the Cathedral held a symbolic importance. 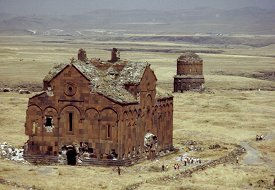 As the victorious Turks looted the city, one of them climbed the roof of the cathedral and tore down the large cross that rose from the top of the dome's conical roof. 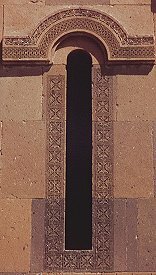 (It is said that this cross was later sealed under the threshold of a mosque so that it could be continuously tramped upon.) The Cathedral was then converted to a mosque and renamed the Fethiye Camisi, the Victory Mosque. It was returned to Christian usage in 1124, and inscriptions tell of restoration work carried out in the early 13th century. 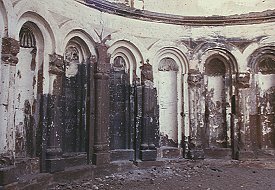 The devastating earthquake of 1319 brought down the dome and may have marked the end of the building's formal religious use. 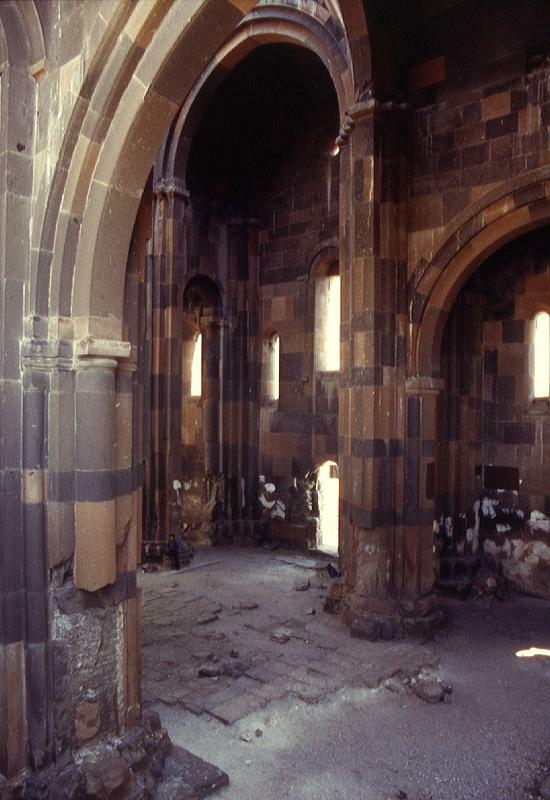 Like most Armenian buildings, the cathedral is built entirely from stone - a facing of extremely well cut and finished polychrome masonry hides a rubble concrete core. The plan is in the form of a domed basilica. This is a pattern found in Armenia since the seventh century. However, Trdat's design takes this old form to new heights of sophistication and originality. The loss of the central dome has given the building a cube-like form it originally did not have. The cupola collapsed in an earthquake in 1319 and the rest of the drum is said to have collapsed during another in 1832. The gaping hole in the north-west corner was caused by the 1988 earthquake, which also caused a serious rent in the south-west corner; by 1998 parts of the roof here had started to fall. 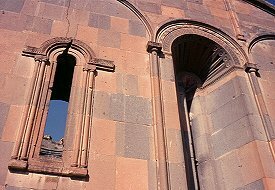 Blasting explosions from the quarry opposite the cathedral during 2000/2001 caused further damage: the crack in the south-west corner deepened and widened considerably, and the west facade started to bulge out from its original position. There is now a risk of the complete collapse of the west facade. A decorative blind arcade on slim columns runs around the whole of the exterior, into which are inserted tall slender windows with frames of finely carved fretwork. 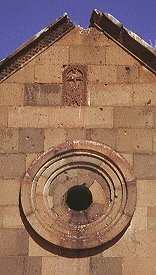 There are also small porthole windows below the gables of each transept. There are entrance doorways in the north, south and west walls - these traditionally were for the patriarch, the king and the people respectively. Standing out in front of each doorway was originally a vaulted porch now mostly destroyed, probably a canopy resting on free-standing pillars. The distinctive triangular niches cut into the north, south and east facades, together with the positioning of the windows, indicate the location of the transepts and apse within. These niches also break up the plain surface of the facades, and give an increased sense of height and solidity to the walls (which are actually very thin). 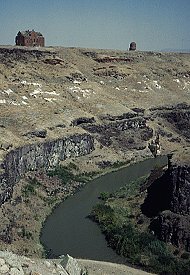 Structurally, the niches also act like a sort of splayed buttress. 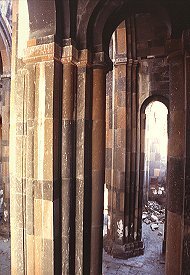 There are no niches on the western facade because a greater thickness of wall is needed here to counteract the thrust of the large arched vault inside. 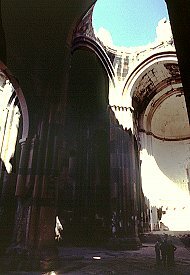 The inside of the cathedral is tall, and rather dark - and would have been even more so when the central dome was in place. This is not a flaw, but an intention. Since the apse and side-chambers account for about a quarter of the interior space, the vaults east of the dome are short, considerably shorter than those west of the dome. Four massive clustered piers in the rectangular nave support both the dome and the arches supporting the roof. The barrel vaults along the east-west and north-south axes are almost as high as the base of the drum, and are expressed outside in the two intersecting pitched roofs. The spacious apse is accommodated beneath the easterly roof and revealed on the outside facade only in the form of a window between two deep niches. The chancel within the apse is elevated from the rest of the floor and has a row of ten semicircular niches containing seats. It is flanked by two-storied chambers whose upper floors are reached by narrow stairs accessed from within the chancel. In spite of having a basilica plan there is little longitudinal emphasis to the design. The building has a short length relative to its breadth and height, and vertical proportions are further emphasised by the use of clustered piers and pilasters. These are shaped as a cluster of square and semi-circular pilasters grouped around a central column. The numerous ribs thus formed rise upward and continue onto the arches supporting the roof and dome. This, together with the use of pointed arches, gives an impression of powerful verticality similar to that found in Gothic architecture (which this building predates by several centuries). 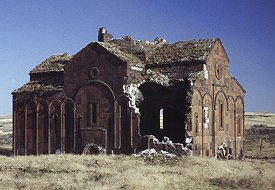 However, there is no evidence to indicate that there was a connection between Armenian architecture and the development of the Gothic style in Western Europe. 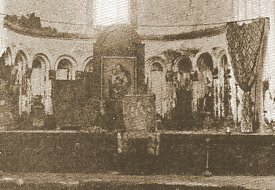 On the apse, hidden under Turkish whitewash, are faint traces of a painting representing God enthroned - it is of a later date than the cathedral; probably from the 13th century restoration. 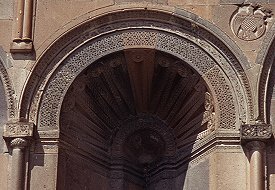 The capitals also show traces of simple, geometric painted decoration. 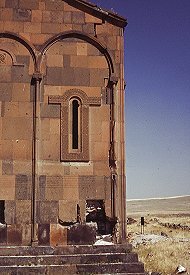 Huge gaps in the interior masonry probably indicate the former position of khatchkars - hacked out when the building was converted to a mosque, or by later treasure hunters. 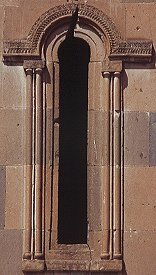 Armenian inscriptions have in recent years been deliberately hidden by coverings of paint designed to match the stonework. This (together with bird droppings) defaces much of the fine interior masonry. Where facing stone next to the floor has been lost, the stone floor paving is seen to run under the walls and a simplified outline of the building’s plan can be seen incised into this paving. Probably the entire plan of the cathedral was carved onto the floor before building work on the walls began - ancient Greek temples were laid out in a similar fashion. Some hold that much of the Cathedral's present appearance is a result of a massive restoration, almost a re-building, during the early 13th century. 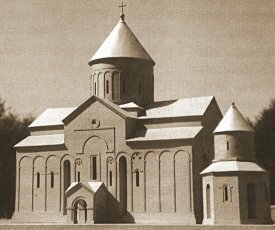 This theory was first proposed by Nikoli Marr, who thought the Cathedral too advanced to be entirely from the 10th century. He tried to explain away the numerous pre-13th century inscriptions on its walls by saying that they were 13th century copies of earlier originals. The theory lacks credibility - there is no structural evidence to back it up, and the exterior details (the position of the arcades, the windows, the niches, etc.) are too closely integrated with the interior to be from a different period. 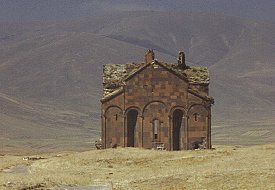 This page [the cathedral of Ani] was first published in 1999. It was last modified on the 24th May 2005.